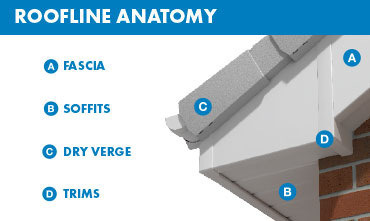 Understanding roofline, fascias and soffits. In fact, there are several different kinds of roofline. All are designed to do a slightly different job, but all are equally important in protecting the fabric of your home from the worst of the weather. Traditionally, roofline was made from long, continuous wooden boards. Just like wooden window frames, however wooden roofline requires regular maintenance and repainting if it’s to stay looking and performing at it’s best. For that reason, many homeowners over the last 20 years or so have opted to replace rotting timber roofline with low maintenance UPVC alternatives. The Eurocell range of roofline products offers a wide choice of styles and colours, including woodgrain to complement our natural frame effect windows and doors. So as well making sure your roof timbers and brickwork are protected from wind-driven rain, they also bring lasting kerb appeal to your property. Use our brief overview to understand more about roofline and how it protects your home. 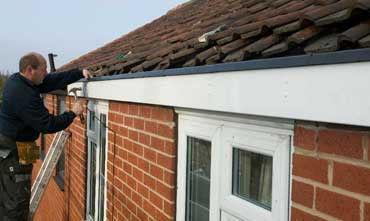 Provide a solid base on which to fix guttering. Stop the exposed ends of your rafters absorbing water, which can lead to damaging damp and rot. As you can see, fascias need to support a good deal of weight without warping or breaking under the strain - especially when you consider several gallons of water per second can be running into the gutters of the average semi during a downpour. That’s why all Eurocell fascias boards are made to last from high quality 18mm uPVC for guaranteed, long-term protection. You can buy Eurocell fascia boards here. Soffits are the boards that fit between the fascia and the wall of your home. They’re less visible than fascias (you have stand closer in to your home to get a good look at them) and slightly less exposed to the full force of the weather. While sealing your roof from animals and the elements, it’s important soffits also allow enough air into your roof space to prevent damp and condensation from building up inside - something that can cause as much damage in the long run as allowing water to penetrate from the outside. Because of that, Eurocell’s lightweight, 9mm soffit boards are all available with integral ventilation slots for increased air circulation. You can buy Eurocell soffit boards here. Bargeboards are simply fascia boards that are fixed to the diagonal edge of the roof along the eaves of your house. Like standard fascias, they do an important job of shielding timbers and brickwork from wind and rain, although they are not as crucial structurally as they don’t have to support the weight of the roof tiles or guttering. You can buy Eurocell bargeboards here. As long as your existing fascias and soffits are free from rot and damage (your local Eurocell accredited partner can carry out an inspection to give you a second opinion) these easy to fit boards can be attached directly on top to create a weatherproof barrier and prevent any future damage. They are available in 8 different colours and widths and in two profile styles. You can buy Eurocell capping boards here. If you have to replace your fascias, the odds are your guttering will need to be updated too. Lighter than the original cast iron and available in a range of profiles and sections to best match the look and style of your home, Eurocell guttering is manufactured in lightweight, high impact uPVC for easy installation and, barring the occasional trip up a ladder to remove leaves and moss, years of maintenance free performance. You can buy Eurocell guttering here. If you think your roofline is damaged - or if you can see signs of wear and tear - it’s important you act quickly. Sometimes, wooden boards can let water seep through into your roof space months or years before the effects become obvious. Local roofing companies will be happy to carry out a full inspection and assessment (much better than taking a look yourself if you’re not completely comfortable at heights) and provide you with a quote. Find your nearest Eurocell Branch by simply by entering your postcode in our branch finder here. Hi Most trims for this application can be found here, in particular : https://www.eurocell.co.uk/fascia-boards/replacement-fascia-18mm/external-900-corner-trim-in-white https://www.eurocell.co.uk/fascia-boards/replacement-fascia-18mm/double-internal-900-corner-trim-in-white Hopefully this answers your question but if you need any further assistance please contact us using our contact form above.